This is Great Doctor Lee Keflen in “Choushinsei Flashman” and the actor Kouji Shimizu who portrayed Keflen. According to an interview article on Shimizu, when he got an offer for Keflen, he asked his son if his son would mind his dad playing the villain in TV show which was highly expected to be watched by his son’s friends. He seriously worried that his son could got bullied just because of the son of the enemy of kid’s hero.His son said he wouldn’t mind at all, so Shimizu decided to accept the offer. Jiro Miyaguchi, who is well known for role of Colonel Zol in Kamen Rider has really tender heart. 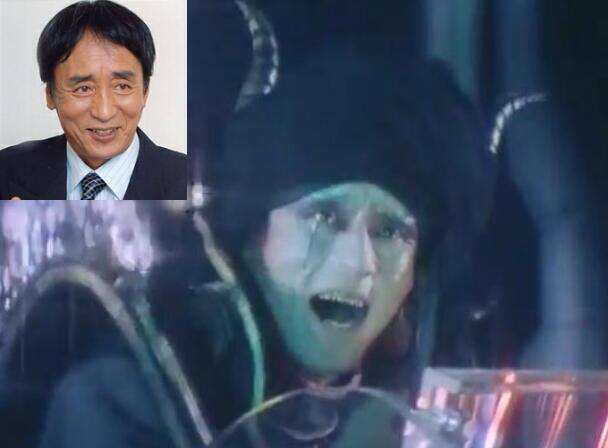 One day he was kicked by a kid after his showing up as Colonel Zol in Kamen Rider stage show.